Our walk begins in Ainhoa in Pays Basque in France which is very different from its neighbouring regions and best illustrated by the unique Basque language. 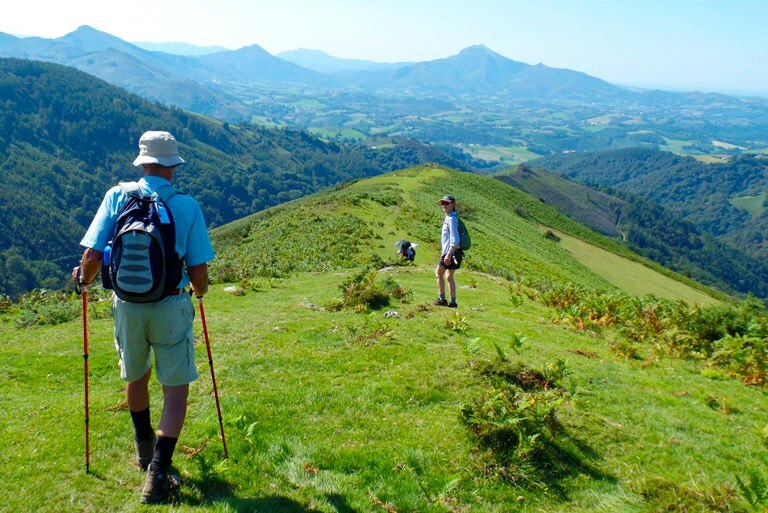 Nestled between the Atlantic Ocean and the high peaks of the Pyrenees, the Basque country offers a superb variety of terrains, wild or cultivated, all enjoying a remarkably generous climate. 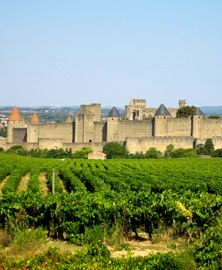 We then move along the Pyrenees range, westwards to Carcassonne in the heart of the picturesque Aude region, where the reputable "Corbière" wine is produced. Carcassonne is known the world over as the best preserved fortified town from the middle ages. Built originally by the "Cathar", dissidents of the main stream catholics, the old city went through a long history of glory and destruction, wealth and abandon to finally be saved and restored in the 19th century. We explore this spectacular region with walks in the "Causses" area around the village of Minerve, the secret vineyards of Corbière hidden in the pretty countryside outside of Carcassonne. 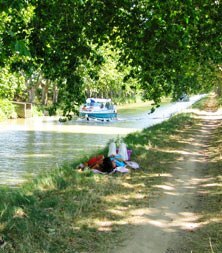 We experience the beauty of the 17th century "Canal du Midi" winding its way between villages in the shade of giant plane trees. Our third and last base for this tour is in the lovely little hilltop town of Grignan in the "Drôme Provençale" just outside of the Rhône valley. Grignan is known for the renaissance chateau sitting at the top, host to many festivals and concerts in the summer months. Here we are at the heart of some of the best names for the "Côte du Rhône" wine. 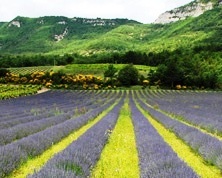 The countryside is a patchwork of vineyards, lavender fields, olive or apricot orchards, truffle oak tree plantations and occasional cereals fields. The region is incredibly charmful and the people generous and friendly. In many villages, time seems to have simply stopped. 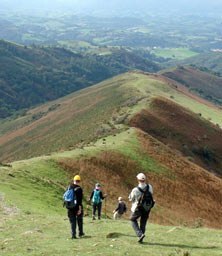 Our walks take us through various parts of the countryside, up and down some high hills, through farms and villages and we don't forget to sample some of the local marvels as we visit olive mills or wineries. In the nearby town of "Vaison-la-Romaine" we witness the remains of ancient days when Romans had established themselves in the region. Our first few days are spent in Ainhoa, one of the most picturesque villages in Pays Basque. Our cosy hotel, classified as a historical monument, dates back to the 17th century and has served as a hostel along the "French Route" of the Pilgrim's Trail. It is extremely comfortable with a secluded garden, swimming pool and sauna. It is renowned for its elegant dining and has in recent years earned a Michelin* for its fabulous cuisine. In the Corbière we stay in a small Chateau just outside of Carcassonne amidst the property's own vineyards. Wine is made there in the cellars and is served freely at the particularly generous dinner table. In Grignan we are based in a beautiful ****hotel surrounded by a vast park right at the foot of the town and Renaissance Chateau. The Hotel is in an 18th century house, originally the residence of the local doctor and maire of Grignan. Our rooms are large and tastefully decorated. We take our dinners there in the hotel with open views to the gardens or even better, weather permitting, outside on the terrace. Departure dates have been arranged to allow both the "Gastronomic Trail through Hidden France" and "Flavours of Italy in the Piedmont" walks to be combined. 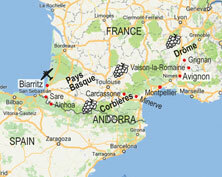 I have just completed the Gastronomic Tour through Southern France. The tour was thoroughly enjoyable and I would highly recommend it. I really had no previous experience of walking tours and was slightly apprehensive about the walking component of the tour - but my fears proved to be unfounded. Our affable guide Gilles went to no end of trouble to ensure we all had a wonderful time. The itinerary was perfect and, in addition to walking in the picturesque countryside, we were able to explore some absolutely delightful French villages. Our accommodation was excellent - and all our meals were delicious and catered for all tastes. The tour was meticulously organised and the itinerary was flexible enough to accommodate small changes to maximise the weather of the day. Thank you to our very competent guide Gilles, whose great sense of humour, in addition to his accomplished piano playing, kept us amused at all times. We are also very grateful to Gilles for the memories he has created for us with his photographs and videos. Thank you." This is the second tour i have done with Gourmet Walkabout, and I thoroughly enjoyed every minute of it! The walks were varied and interesting, i think my favourite was the Pays Basque and staying at Ainhoa, the countryside was glorious, then Siran the typical French village was friendly and offered local bar, which was fun and the local boulangerie, not to be surpassed by our stay in Grignan a fascinating artistic village where we could find a cosy bar to drink our Rose wine and art shops to pick up delightful souvenirs. We really felt at home in all our accomodations, often adjourning to our private salon to play the grand piano and recollect on the day. Gilles was a wonderful guide full of fun and managed his eight women with great finesse, adjusting the plan to get around flood damage and keeping our itinerary flowing without hitches, finding Post Offices to satisfy every need, and reglueing walking boots to keep everyone in the action! Our final dejeuner at the Clos de Châteauneuf-du-Pape was nostalgic and full of sweet parting sorrows where we tasted the very best wines and took the glorious menu in our stride as we had done continually for the 15 days! We were blessed with glorious October weather, narrowly missing the floods in Carcassonne, but when the Mistral came in we knew it was time to go home and count our blessings!" This was our second trip with Walkabout, and we thoroughly enjoyed the 2 weeks. Excellent organisation, very good accommodation and meals, and top class guides Gilles and Helmut. We really liked the week after the tour in Forcalquier, in one of Walkabout's apartments; a very relaxing time in a lovely little French village. Now planning our next walkabout: the Celtic tour." We enjoyed getting to know a part of France unfamiliar to us. Our eyes feasted on pastoral landscapes, vineyards with leaves turning gold and red, olive trees, and old fortresses. The accommodations were very good and we delighted in liberal sampling of wines and cuisine of every region." A thoroughly enjoyable holiday guided superbly by the unflappable Gilles. The walks were interesting and challenging, creating the much needed appetite for the wonderful dinners presented each night. Slight changes to the printed itinerary, enhanced the programme immensely, including the visit to San Sebastion and the wine tasting evening in the Minervois. Looking forward to our next tour, just need to shed a few kilos first." I've well and truly recovered from my 6 weeks in Italy, the 3 weeks of school and the Walk the Gourmet Trail and I thought I should write and let you know how much I enjoyed the walk. Our guides were Helmut and Milo and they were exceptional from when I arrived a day late in Novello until I left them following lunch in Orvieto. In every place we stayed or visited we were given very full details of where we were, why we were there, the history of the location, where we could get the best meals, shops and anything else that we might have wanted to see, visit or purchase and what the itinerary was for the evening and the next day. During the course of the walks we visited different points of interest and Helmut gave a short but pithy account of why we were there and why it should be of benefit for us to be there. This made the trip very interesting because of the local knowledge which was imparted to us by Helmut and backed up by Milo. Helmut's guidance and knowledge of the walk from beginning to end, were impeccable and he was ably backed up by Milo. 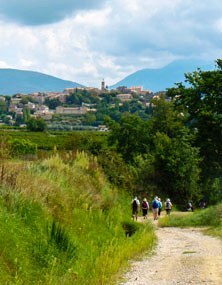 The walk itself, from Novello in Piemonte, the Cinque Terre, San Gimignano and Lake Bolsena, was great and each part had its own challenges and/or delights." We like to have fun as well as adventure on holidays & this certainly achieved both plus lots of hidden "add-ons" along the way. Gabriela & Gilles' attention to the needs of our group was excellent especially in helping a lady in distress! Their knowledge of areas and ancient villages was outstanding and it seemed no effort to take us to other treasures... Accommodation & food was top class with wines to match... It was fun going to a supermarket in Spain to get next day's lunch goodies. 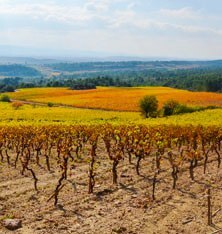 We were fortunate to walk through vineyards in full autumn colours, as well as Plane trees & Poplars, and could appreciate the charm & beauty of these areas at a leisurely pace. Being in our 70's, the regular walking & gradients didn't appear any problem and at the end we both commented on how our fitness level had certainly improved! I Could on... Finally, a BIG thank you to Gabriela who organised a bus to the Forcalquier apartments and to Graeme who fetched us from the bus late at night somewhere along the way... but that's another adventure! 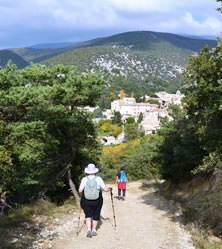 This was our fifth Walkabout Gourmet Adventure, it lived up to the reputation of the others, great guides, superb accommodation, and interesting walks as well as visits to wineries, villages, particularly fascinating was an ancient Roman Town "Vaison la Romaine" - as previously the Group of like minded people all got on well. A Standout! Robert and I have walked with WGA in Italy, France, Corsica, Spain, Crete, Sicily, Slovenia, Norway, Croatia, and Morocco. We have thoroughly enjoyed each experience which is why we keep coming back for more. Somehow this last one has been, for me, a standout. It ticked every box for us. The walking was interesting and varied. The accommodation was first class; small, comfortable, interesting and mostly family run. The travel days were interesting and not too much time was spent in the vans. A good walk and an interesting stop were often included so we arrived refreshed and enthused. This tour is described as an astronomical tour and it certainly lives up to that claim. However the walking is still interesting and of a good length each day which is necessary to compensate for the food consumption! We climbed mountains, walked through vineyards, saw horses and sheep, olive groves, lavender, fields of sunflowers, and vineyards. We saw where they grow truffles and even met a farmer in a trap exercising his pet donkey! One walk was most aromatic as we brushed against wild thyme and fennel. We picnicked amongst the pine trees and gathered thyme to sprinkle on our tomatoes and bread we had purchased from the local markets. We in stopped in little villages way up high and enjoyed sorbet and ice cream on more than one occasion. The food was amazing and the wines superb! We certainly enjoyed many really great wines on this tour. The people on this tour were fun and easy going and provided some good laughs and fine company at night. Our guides Gabriela and Gilles were positive, supportive, professional and caring and also... great company! On the last day we traveled to Chateauneuf du Pape where we enjoyed another wine tasting. I learnt something very wise from this wine maker. "The only great wine is the one you enjoy!" We certainly did enjoy. Thank you walkabout , we'll be back!" Our first walking tour, and what an introduction. It was well-organised and the hotels and their settings were delightful, and the food lived up to the promise in the title of the tour. We had only been home about ten days and we were looking for some mountains to walk in so went to O'Reilly's on the Lamington Plateau for a couple of days and it has fired us up to do more. We appreciated Gilles checking out the next day's route after a full day's walking with us. Did he ever get a chance to eat every course at dinner? What other guides would drive you several kilometres to buy a replacement pair of boots and supervise the purchase. Thank you Gabriela and Giles for hosting such and enjoyable tour. The charming apartment in Forcalquier was a special treat at the end of the trip."